Before conflict erupted in 2011, Aleppo had a pervading sense of history, with donkey-drawn carts and sidewalk vendors lining its winding streets. Five times a day, Muslims could hear a muezzin's call for them to pray in every part of the city. Mornings were the best time to visit the Old City, before it got too crowded. History buffs enjoyed visiting the Great Mosque, the Citadel, Saint Simeon's Basilica, and the Bimaristan Arghan. 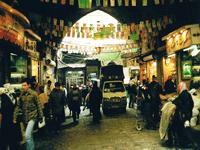 Aleppo's souqs were among its most popular attractions. Bargain-hunters could find anything from gold and silver jewellery, to carpets, clothes, and olive-oil soap. Also, Aleppo was famous for its intricate wood inlay boxes, which made great souvenirs. Travellers could visit around 700 UNESCO-recognised historical sites and villages just outside of Aleppo. Known as the Dead Cities, they were well worth a day trip. The war has damaged much of Aleppo, including its historical sites. Travellers are strongly advised to stay out of the entire country, as it remains an active war zone.